The American Dental Association designates February as National Children’s Dental Health Month. Of course, for Birmingham children’s dentist Dr. Angelica Rohner, every month is children’s dental health month! But now seems like a particularly appropriate time to talk about how parents can help their children have healthy and beautiful smiles. Think you child is too young for dental care? Think again. 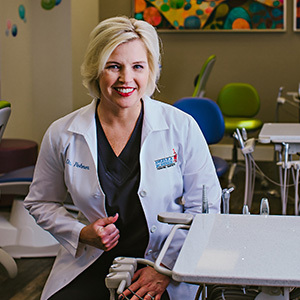 Birmingham pediatric dentist Dr. Rohner suggests parents start caring for their children’s teeth while they are still infants. Before that first pearly white appears, oral care is necessary. Use a soft and damp cloth to gently wipe your baby’s gums after each feeding. The sugar that is in breast milk or formula should be removed with these quick cleanings. 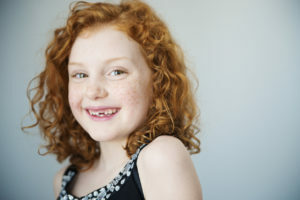 Once you son or daughter has teeth, it’s time to start brushing and flossing and seeing the kids’ dentist in Birmingham. Start brushing with a small, soft toothbrush and water. Don’t use toothpaste until you’re certain your child knows how to rinse and spit out the residue. Then, you can add a small dab of toothpaste with fluoride. The time to begin flossing is when your child’s smile shows two touching teeth. Carefully guide the floss between two teeth and gently move it up and down. Your child’s mouth has plaque and bacteria just as your mouth does. And where there’s plaque, there’s a risk of gum disease—even among young children. Just like mommy and daddy, children need to see the dentist twice each year for checkups. At these visits, the hygienist will count and clean their teeth. We’ll also take annual digital x-rays to find hidden spots of decay. Dr. Rohner may also recommend fluoride treatments or dental sealants to help your children avoid tooth decay. Fluoride treatments strengthen tooth enamel and even help to remineralize a spot where this outer surface has begun to thin. Dental sealants go on as a liquid plastic and dry to create a hard surface that protects your child’s molars from the “nasties” that can lead to cavities. Both of these treatments only take a few minutes and can easily be completed at the conclusion of a dental checkup. Nothing encourages children to take care of their teeth like seeing their parents brush and floss their teeth at home. Make oral hygiene a priority for yourself and your children will do the same. If your children need to a pediatric dentist in Birmingham, then call the office of Dr. Rohner.